Preparing for an ascent of Mt. Whitney or any mountain peak takes rigorous physical and mental conditioning. Peakbaggers know that physical conditioning at higher altitudes is necessary to build a strong cardiovascular system and is also part of the mental conditioning process. This mental conditioning can be acquired only though time and experience spent at higher altitude in wilderness surroundings. There is no amount of fitness conditioning at lower elevations that can prepare one for the pressures of the "altitude wilderness experience." Altitude affects everyone differently, and its effects can vary from trip to trip. Common physical effects of high altitude include: nausea, headaches, heart palpitations and swelling. Other effects are High Altitude Pulmonary Edema (HAPE) – when the lungs fill up with fluid as a result of the body adapting to high elevation – and High altitude cerebral edema (HACE) – the result of swelling of brain tissue from fluid leakage, which almost always begins as acute mountain sickness. At worst these symptoms can be fatal or at least painful and overwhelming. The treatment for any physical manifestation of altitude sickness is not difficult: Set aside the ego, turn around and go back down the mountain. Symptoms will subside as the hiker descends to lower elevations. The more subtle impact of what I call, 'wilderness anxiety" is less obvious and can manifest itself in many ways that include; refusal to eat or drink, panic that increases with altitude gain, confusion, irritability and moody outbursts. If a member of your group becomes inexplicably agitated, the chances are they are experiencing wilderness anxiety. I have witnessed varying degrees of wilderness anxiety, but the worst case was on a trip to the San Gorgonio summit (11,501-foot elevation). Our small group was well prepared for this hike. All participants were in tiptop shape and had been on conditioning hikes in the local mountains. On day-one of the trip, after a few miles into the hike, the least likely of the group began to demonstrate abnormal fear and increasingly frantic behavior. He was a seasoned hiker but was experiencing wilderness anxiety, and the irrational behaviors increased as we gained elevation. Wilderness anxiety is involuntary and once its victims are back down the mountain, they often do not even remember the incident. To avoid this party crasher, be aware that even the most capable hiker can display these symptoms and there is no way of judging this until you have observed the hiker at higher altitude and wilderness conditions. How much experience does this person have at higher altitudes while in the wilderness? What is the highest altitude this person has attained previously? How will this person behave in an emergency situation? Will he/she follow directions? Do we work together well as a team? Can I call upon someone else to lead if needed? Do we have the physical and mental conditioning necessary to complete the trip? On high altitude hikes; what affects one, affects all. By spending sufficient time in the wilderness at higher altitudes before hiking Mt. 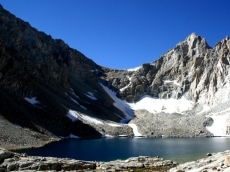 Whitney, peakbaggers will help ensure a memorable journey to the summit.